I can tell you, from experience, that very few people know neither who Andre Michaux was nor the contributions that he made to the United States. Yet, one of my favorite places on the face of the earth bares his name...a forest in south central Pennsylvania that holds so much beauty...and for me nothing but good memories and experiences. 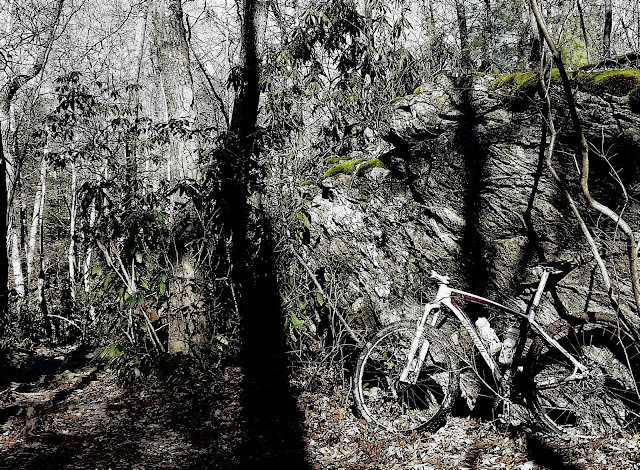 It is in this forest that I truly learned how to mountain bike. It is in this forest that one of my best friends, Mark Lentz, taught me so much about nature and how to identify landmarks, both natural and man made. It is in this forest that I always find happiness and peace. It is in this forest that I proposed to my wife....and it is in this forest that she said "yes." Yet, nobody knows seems to know who this man from France was. 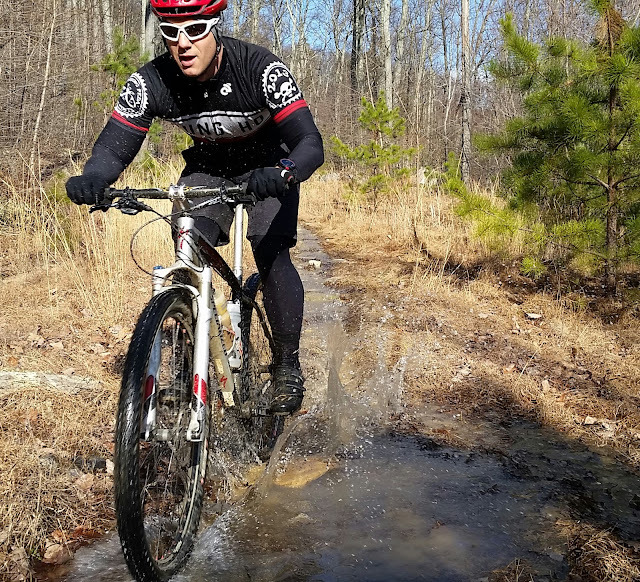 Michaux State Forest has been my favorite place to mountain bike since Mark Lentz first brought me here in 2006. It's shear size can be intimidating...but around each turn the opportunity for adventure and discovery awaits. In 1785, a boat, carrying the royal botanist of King Louis XVI of France, docked in New York City. 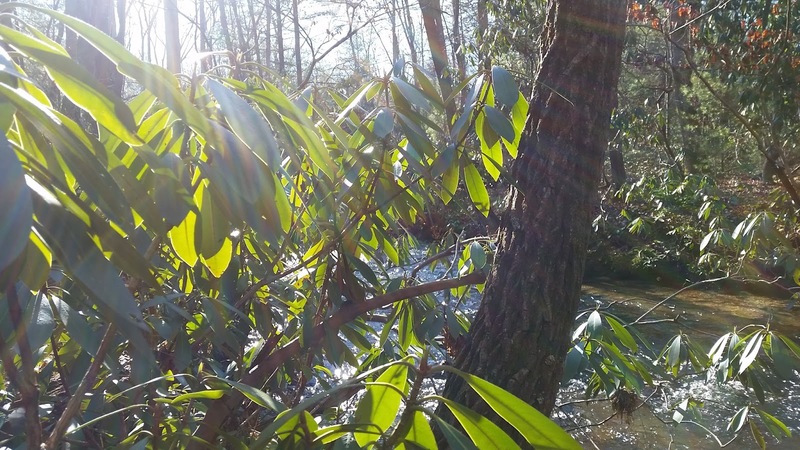 The primary goal of Michaux's mission was to search America's forests for new species of trees that could be used to replenish the forests of France. For almost a century, France had been engaged in a series of wars with Great Britain, which had stripped the best timber from the French forests for the building of warships. Throughout the late 1780s and early 1790s, Andre Michaux traveled as far south as Charleston, South Carolina and as far west as Kentucky. In addition to shipping American plants to France, Michaux also introduced new plants to America. The mimosa or silk tree, Albizia julibrissin, the crape myrtle, Lagerstoemia indica, the tea plant, and the camillia are only some of the plants he is credited with bringing to America. In the winter, the forest takes on a completely different identity. The absence of foliage on the trees allows a visitor to the woods the opportunity to see deeper into the forest. This was evident as Mike Alicea and I began today's ride. As we climbed up Bendersville Road and turned onto the ATV trails we were able to see across the valley to the ridge that we would ride on the second half of today's adventure. I've always referred to the ATV trail on slate road as the "easy button." A two mile climb up to the top of Piney Ridge. On a cold day like today this climb was a great way to get our blood flowing and keep our fingers and toes warm. 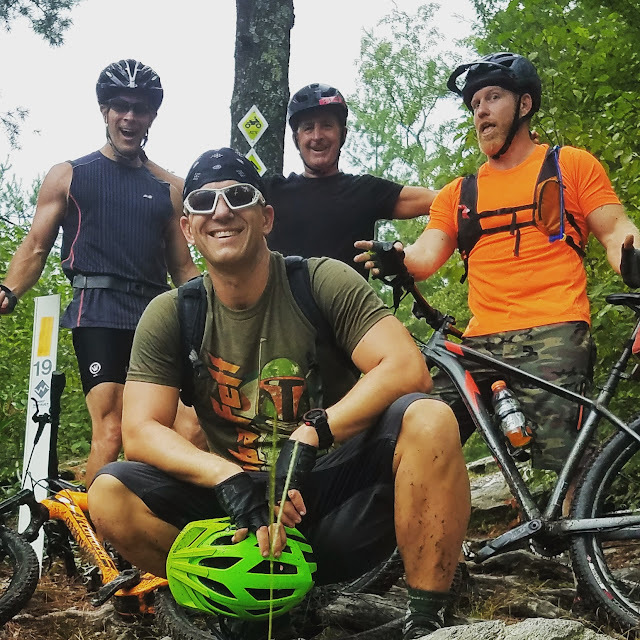 By the time we reached the top of the the trail we had already climbed over 600 feet! 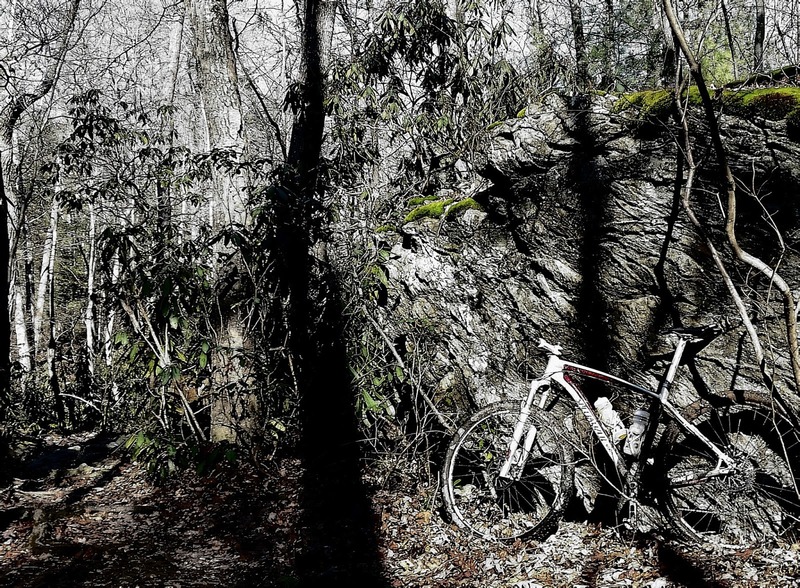 It's the nature of Michaux, though. Everything is big. Especially the climbs. Flying down the back side of the "easy button," Mike and I crossed route 233 and spent the rest of our ride on the single track on near Mountain Creek...all the while, taking time to explore and look around. 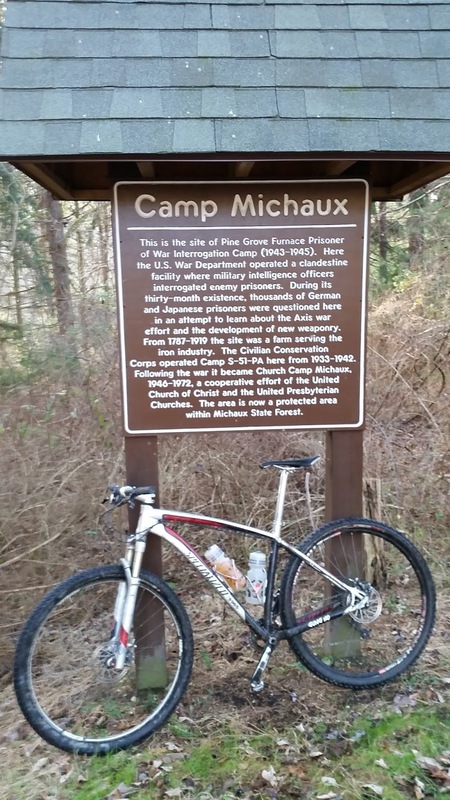 My main goal was to make sure that Mike had an opportunity to check out the remains of Camp Michaux, a former Civilian Conservation Corps camp that, in 1943, was converted for use as a secret interrogation camp for enemy German and Japanese prisoners of war. 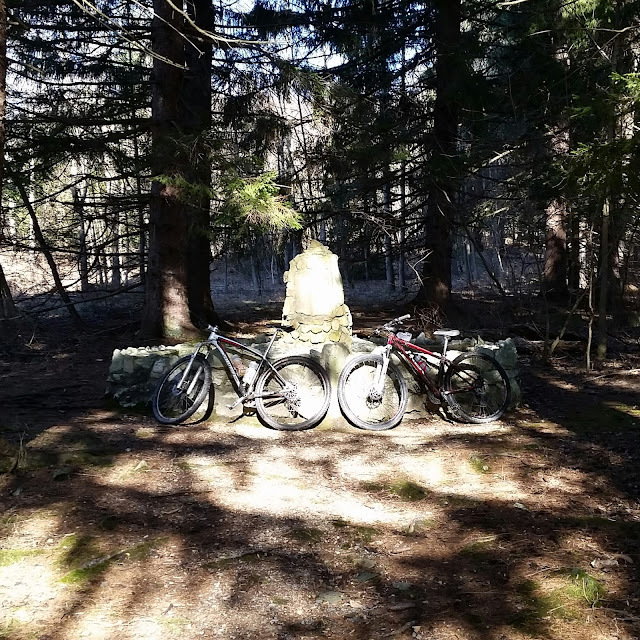 Less than a quarter of mile down the road from Camp Michaux, Mike and I turned onto Dynamite Shack trail...a 3 mile stretch of single track that runs parallel to Tom's Run Creek and will eventually bring us back to the Furnace Stack area of Pine Grove Furnace State Park. 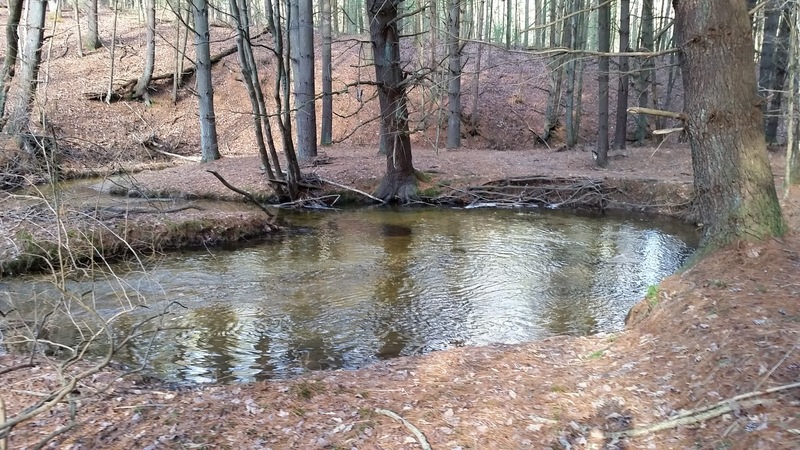 Tom's Run is a beautiful and pristine creek that wanders through the woods. 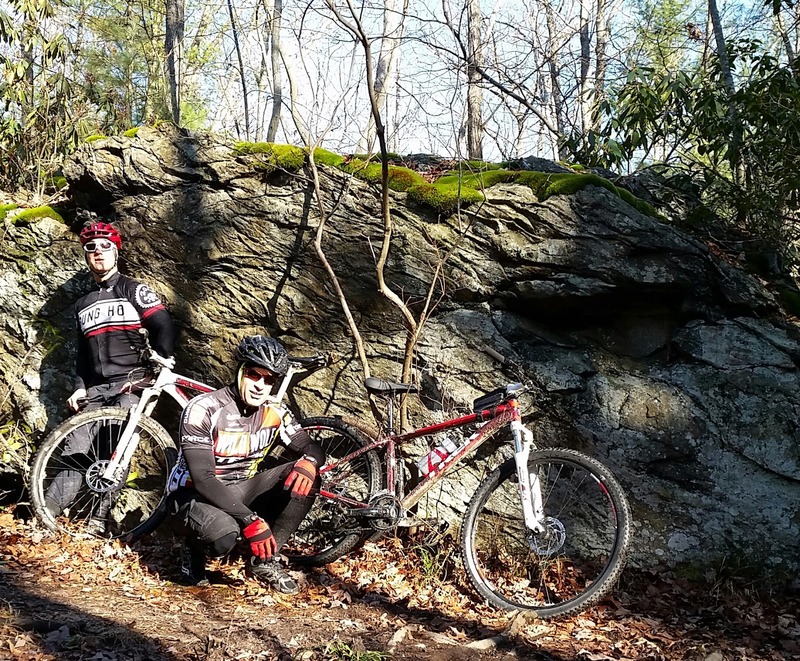 Following the trail next to the creek is the perfect way to either begin, or end, a ride at Michaux. I can't help but look and wonder at the magnitude of space and beauty each and every time I visit Michaux forest...and I can't help be be amazed at the variety of creation that envelopes me while I am there. So, even though most people don't know who he was, or the contributions he made, I have a great appreciation for Andre Michaux and the forest in south central Pennsylvania that bares his name.